The Devine Write: Why Do I Write a Blog? Why do I sit at a computer and spill my guts on the internet? For all the fame and glory. Beyond that, I have fun doing it. I like words, and I like sharing my successes and failures so others can learn from them (or laugh at them). 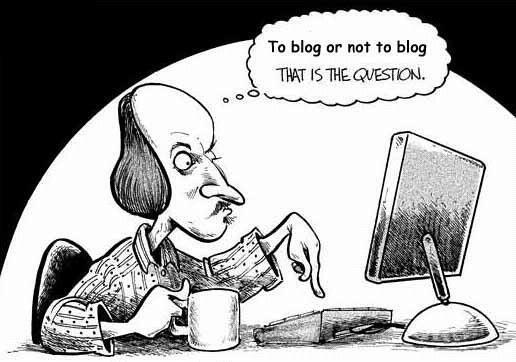 Perhaps some of you are considering the idea of blogging. I know some of you already do. Keep doing it. If you haven't started, start. I don't think you'll regret it. Having said that, if you're the type of person who lacks commitment and has a propensity to quit, you might want to work on that issue before you start blogging (or doing anything). #1 Fills up my spare time. For months I would goof off on the internet and read news stories that I really didn't care about. Now I do something more rewarding (remember all the fame and money!). #2 Helps me articulate my thoughts. Writing is a fantastic human expression. It allows me time to concentrate on what I have experienced, what I learned from it, and how I will apply what I've learned. It provides opportunity to reflect, to consider, and to reminisce. I have found the whole writing process very beneficial. Whether you like it or not, once you're written something, you are more committed to it. If telling a story, you better think long and hard about whether you are accurately portraying the events. Be honest, be clear, and include ALL the information--not just what makes you look good. If sharing an opinion or perspective, you should scrutinize your own ideas harder than anyone else. This process lets you filter out all the dumb ideas you have and reject them. I found many of my ideas were really stupid when I started writing about them. After writing something, I realize that hundreds (maybe someday thousands) of people have read it. That means if they know me or meet me, I better live up to my words. If I don't, I'm pretty much worse than useless. Numbers 1-3 were mostly about me--the writer. This one is for you--the reader. Very few things motivate me to keep writing like having a reader tell me that they enjoyed a post or that it helped them in some way. It translates, "Hey Dan, you're not wasting your time." Some people might like wasting time. I'm not in that group. At the risk of sounding overly philosophical, it excites me that my words will outlive my body. If I die tomorrow, my posts will be there for my family and friends to read. I'm not pretending to be a legend or an oracle of human knowledge, but anything beneficial I learn or know will die with me--unless I write about it.